Nats let fans vote for bobblehead night. Pudge or Teddy? | Let Teddy Win! Nats let fans vote for bobblehead night. Pudge or Teddy? The recently-announced Nationals Promotion Schedule features three bobblehead giveaway nights for 2010, including a free Ryan Zimmerman bobblehead in June, a free Nyjer Morgan bobblehead in July, and a “fan’s choice” bobblehead in August. This week the team opened voting for that “fans choice” game with a Nationals Bobblehead Sweepstakes. Nats fans can place your votes online to create a bobblehead for Pudge Rodriguez, John Lannan, Jim Riggleman, Jesus Flores, or Teddy Roosevelt. A write-in option is available as well. One voter will be selected to win a bobblehead autographed by the winner. 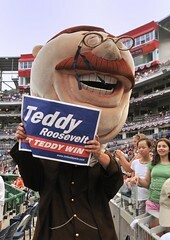 Not that we have a bias or anything, but if Teddy wins, we’ll definitely be having a party at Nationals Park for our favorite racing president on August 28. To vote, just visit the site and check the box next to the photo of Teddy holding up one of our Let Teddy Win campaign signs. As this is a sweepstakes with a prize, the terms limit entries to one per person/email address/household.